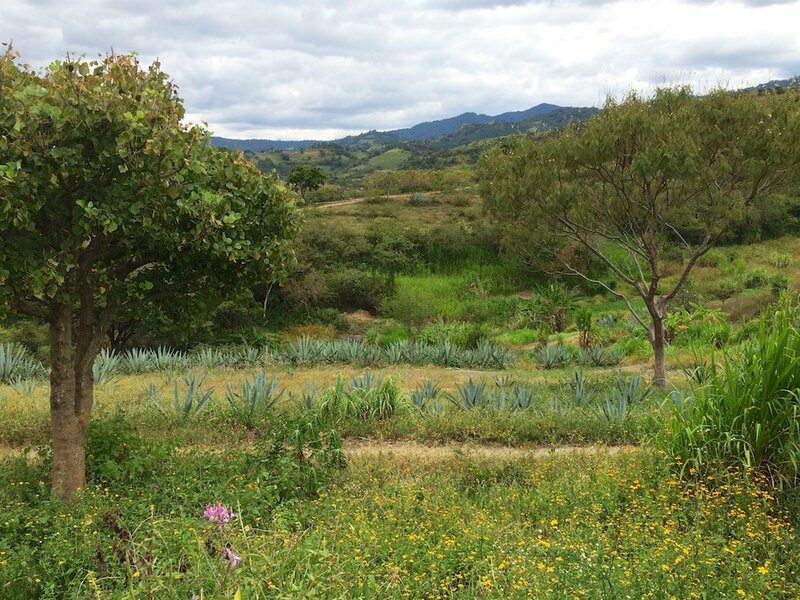 The palenque and agave fields of Salomón Rey Rodriguez or “Tío Rey” (Uncle Rey) are located in the famous Mezcal region Sola de Vega. This town is the most famous spot in the world for Agave Tobalá. The region distills almost exclusively using clay pots “Olla de Barro”. Tío Rey’s town of Gulerá is about 15 minutes up the valley and is part of the municipality Villas Sola de Vega. The lush mountain valley is a 2.5-hour drive from Oaxaca and sits at 1450 M above sea level. (16°28'44.72"N 96°57'42.80"W). Tío Rey has a great supply of spring water that flows year-round and contributes to his unique flavor. The mineral rich soil and relatively cooler climate make for a perfect spot for growing a variety of Agave. Sola de Vega has the most diversity of agave in Oaxaca and therefore the world. Salomón Rey has at least 15 varieties of agave that he cultivates, including: Espadín, Coyote, Arroqueño, Mexicano, Tobalá, Sierra Negra, Madre Cuixe and Barril. The palenque (distillery) is at Tío Rey’s ranch where he lives full time with his family. He built it approximately 10 years ago from parts of an older palenque that was his fathers. It moved around from nearby locations over the years. The lineage of mezcaleros in Tío Rey’s family could arguably go back thousands of years. They emigrated from the Miahuatlán region over 100 years ago due to Zapatista activity during the Mexican Revolution. Tío Rey has never produced Mezcal commercially before Mezcal Vago and produces Mezcal exclusively for Mezcal Vago. Tío Rey’s batch sizes are anywhere from 100 liters to 450 liters. He has two classic earthen ovens that can each hold around three tons. One oven is the normal dug out hole in the ground and lined with large River rocks and the other is dug straight into bedrock. He roasts each batch for 2 to 3 days. The cooked agave is hand ground with wooden mallets called mazos. The roasted piñas are chopped slightly with a machete then the pieces are placed on a wooden platform and pounded with the mallets. The whole family does this, grandma, grandkids, and wife, everybody 12 hours straight. An incredibly laborious technique but they are sure the flavor is better this way when not molested by such modern technology as a cement wheel and horse! Tío Rey has five fermentation vats. Three are typical vats, cylindrical and made from pine. Two have a capacity of 1,200 liters and the third holds 900 liters. The fourth is made from the trunk of a large Pino Sabino (Pine tree) hollowed out in the shape of a canoe and has been in use for 90 years and holds about 900 liters! For distillation, Tío Rey uses a series of clay pots. The clay pots are called “Olla de Barro” in Spanish. That is why Mezcal Vago refers to its Mezcals as “en Barro.” They hold about 50 liters each. Each pair of pots shares a fire. The stills are made of stacks of two pots. One that holds the mash and has an open top, and another with an open bottom that rests on top of the first one. On the top pot there is an upside-down stainless steel bowl that water continually runs in and out of. When the heat from the mash rises and hits the cool top created by the water, condensation occurs. An agave leaf works as a large spoon to catch the dripping condensation (Mezcal) and runs into a piece of carrizo and into the collection container. The process is extremely laborious and takes probably 4 times the effort of a copper still and stone tahona process. First distillation of a ~45 liter load of tepache takes about 3 - 4 hours and will produce about 8.5 liters of xixe that will have an ABV in the mid-20′s. The next 1.5 hours will produce ~1.5 liters of xixe that does not contain enough flavor to produce mezcal and will be redistilled later for other uses around the palenque. A ~50 liter batch of xixe will undergo second distillation, or “rectificación” over a period of 5 - 6 hours total. The first 1-2 hours will produce about 2 liters of heads, or “puntas,” which range between ~65-70% ABV. The next 3-4 hours will produce about 15-20 liters of mezcal at a proof of ~40-65% ABV. The final 15 - 20 minutes will produce about ~2-3 liters of tails, or “colas” that are roughly 30% ABV. The puntas and colas of the rectificación will be redistilled a third time to be used around the palenque. The containers of usable mezcal will be allowed to rest for a few days before being blended into one single homogeneous batch and then rested in stainless steel or glass. Tío Rey never adds water to his mezcal post distillation, he only brings his mezcal back by using puntas and colas. Cuts are made by taste and smell. All of Tío Rey’s Mezcal go through a simple triple sediment filtration through tubular cellulose filters. The bottling is done by hand in the city of Oaxaca. The light filtration is the only way the mezcal is affected between how it was made on the palenque and how it ends up in the bottle.